WHAT I SMELL: L’Attesa opens with a flattened bergamot with a slightly soured neroli that feels waxy, slightly yeasty and thickened like a styrofoam cushion. After a short time, a faint iris begins to appear, floating in a thin layer under the rest of the perfume. Soon the iris begins to grow and expand as it takes center stage. This is a warmed iris and a rather creamy one at that. The iris is soon met with a melding of other florals and the perfume starts to feel as if it’s a warmed scarf wrapped around the neck. The perfume radiates, but it’s very subdued and incredibly comforting. After around 10 minutes, a peppered suede wraps itself over the florals. It’s smooth and sensual and as it continues to develop the creaminess moves to a powder and the perfume pulls out all moisture. At this time, there’s a lightly sweetened powdered lipstick edge to the perfume which I really like. Eventually, the perfume settles in this powdered projection over a smooth and hazy slightly soured sandalwood. All is set for the rendezvous. The soft lights seem to fondle the wrinkled sound of the old vinyl disc, and play hide-and-seek in the warm embrace of the jazz singer’s voice. The wide french-window is opened on the terrace. Outside, only the cicadas shrill drowning and the warm summer breeze. On the tea-table, a nosegay of freshly plucked flowers, flooding the room with a cocktail of smells and a bright colour palette. You uncork a champagne bottle and fill the two flutes. The unmistakable flavour of yeast hovers in the air. You settle into the couch, to enjoy this moment, and take a good look around – every single detail is simply perfect. You then close your eyes, breathe deeply, listen to the sound of her steps on the stairs. Can’t help smiling. You wish these moments would never end. There comes a knock on the door. WHAT IT SMELLS LIKE TO ME: A beautiful, graceful and majestic Lippizan Stallion. BOTTOM LINE: L’Attesa unfolds in he most beautiful manner. It’s exquisite in its blending of the warmed iris and florals. My one wish is that it would have remained in the middle state of the creamy florals for the remainder of the perfume. However, that doesn’t distract from the perfume which is wonderfully different and unique. 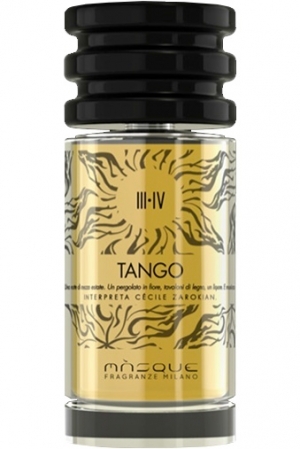 Also, kudos to Masque Milano for their new bottles which easily match the perfume in terms of beauty. Sample courtesy of Masque Milano. Opinion my own. Categories: Masque | Tags: 4 bones, EDP, floral woody musk, fragrance, L'Attesa, Luca Maffei, Masque, New Release, parfum, Perfume, Perfume Review, review, unisex | Permalink.